Wolves, wolves, wolves. There seems to be an awful lot of wolf-bands out there at the moment; Patrick Wolf, Wolfparade, Wolfmother, We are wolves, and so forth. 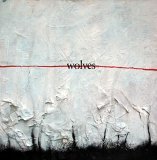 My latest novel don't exactly qualify for the 'we included an animal in the canine family in our name'-thing, but their debut album "Wolves" has qualities you'd expect to find in any self-respecting canine band. Being compared to the superb Arcade Fire by the NME isn't something to take lightly, and it seems that Scottish "My Latest Novel" don't. Whilst their rise from a band (presumably) practicing in someones basement to a band with a debut album out on Bella Union records, the quality is definitely there. From the opening track "Ghost in the gutter" to previous single and closer "The reputation of Ross Francis" the band creates a delightful ambiance and scenery. Violins soar, guitars strum and drums get beaten. It's a lovely mix of folk-y melodies and the soaring crescendos of Godspeed You! Black Emperor (albeit without the 15-minutes long build ups). Comparisons to other Scottish bands are apparently compulsory when it comes to bands from the highlands. In "the novel"'s case, this means being compared to Belle & Sebastian (boring) to no end, and unfounded references to Mogwai. Personally I hear more of Arab Strap, the aforementioned GY!BE and good ol' folk, wrapped in a darling pop blanket. Take, for example, single "Sister Sneaker Sister Soul" with its lovely verse and spine-tingling crescendo that brings back memories of the Strap at their best. However, no album is ever really perfect, is it? There are moments where "Wolves" drags on a bit. The title track (of sorts) seems to last absolute ages (for no apparent reason as well - the opening is really ace!). "The job Mr. Kurz done" is another...well... not exactly memorable moment, it becomes hard to recall the song in particular. Despite the fillers, the album goes from strength to strength, and even survives the relentless onslaught of those two pillars of rubbish music - child choirs and bongos. Yes, that's right, even bongos. The quiet moods of "Boredom killed another" makes for perfect listening on those long train rides through the British countryside, and even the odd verse about 'lego men' on "Learning Lego" makes you feel good. It certainly makes me feel good. An essential purchase for those who like to be charmed halfway to death by singing Scottish people armed with violins and the like.